Don't be basic; simply learn the Gen Z slang and you'll be totes* Gucci. It seems that every few years or so, new hip terms and lingo enter our lives, and we're forced to either adapt and learn the slang or be stuck in our ways and feel disconnected from everything and everybody. And like previous generations, the kids of Gen Z -- those born between 1996 and 2010 -- have come up with their own slang, much of it tied into the media culture they've grown up with. So, we've looked far and wide for the best Gen Z slang around the internet (and talked to our local teens as well) and compiled the most-used Gen Z terms into this comprehensive guide in order to help you get a better grasp on the lingo. You're welcome. "Adult" has moved from a noun to a verb. It refers to moments or actions that appear mature or grown-up. Acronym for "before anyone/anything else." Used to describe one's significant other. Refers to someone who is unoriginal and only follows mainstream trends. Slang for "fa sho," which is slang for "for sure." Originally a shortened version of "Wanna bet? ", the use has expanded. Gender-neutral term for a friend; can be used in disgust or excitement. An expression that denotes various emotional responses when a person can't comprehend what was said or what's happening. Used on blogging sites like Tumblr. The new way of saying cool. "He's not uptight; he's pretty chill." Something that makes one cringe. To reject someone's direct (or, at times, indirect) sexual advances. You essentially "curve them." Short for "details." Typically gossip. Over the top or excessive. Someone who is exhibiting dramatic behavior. Used to describe those you consider family. Short for "fake Instagram." Typically used for memes, inside jokes, etc. Describes something that is really good or cool. Means "get away from me." Originally from the Fortnight game. A transformation of one's appearance, usually from unattractive to very attractive. A term used to describe what someone wants in their life (i.e., "Couple goals, squad goals"). Comes from the high-end fashion brand. Another way to say "good," "chill," or "awesome." An acronym for "hit me up," which could refer to hanging out, texting, or talking on the phone. Used to describe one's thoughts, desires, or feelings in a proclaiming, exclamatory manner. The opposite of "low-key." Something that is highly influential or unique, like works of art, artists, performers, etc. A reaction to someone being funny. A replacement for LMAO. An internet meme-derived made-up disease that people frequently reference as a joke. "Why isn't he in school today? He probably has Ligma." When something is amazing or popping. Used to describe one's thoughts, desires, or feelings in a subtle way. Another way of saying "Me too; I can relate to that." Used in lieu of "same here;" relatable; summing up one's life. A deflection; basically the modern version of "I know you are, but what am I?" Describes perfection. "Her eyebrows are 'on fleek.'" The same as "yikes." When you don’t really care but should at least say something. Stands for "One True Pairing;" your favorite "ship" (see Ship definition below). An insult, or to insult someone. Being upset over something little or inconvenient. When a third person wants two other people to be in a relationship -- or supports an existing relationship. Another way to say you're shocked or surprised. Used by a third party in response to two people arguing or insulting one another. Another way to say you "killed it" or succeeded in something. A phrase used to signify that one wants to send a flirtatious message over social media. Extremely small and cute; or, extremely large and cute in an ironic way. Basically, just cute. An attractive person; someone that looks so good that you want to eat them for a snack. Related: The phrase "full-course meal" was derived from "snacc" -- it refers to an upgrade. The scoop or gossip. "Spill the tea." Pleasantly plump; curvy in the right places. Describes someone who is desperate for attention from a romantic interest. Upset, sad, or disgusted; has evolved from its original definition of being reminded of a negative situation. When something happens so unexpectedly that your wig flies off your head; blown away. Describes someone who's deep or intellectually enlightened. Used when someone is expressing a ton of excitement over something, or another way to say "yes." An exclamation that could be used in various situations -- as a way to say "yes," to express excitement, to issue a battle cry, etc. -- depending on context. Yeet is also used to accompany a throw. 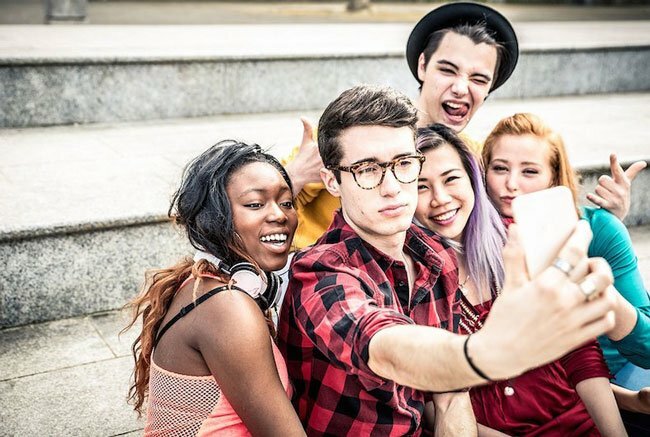 **This list of Gen Z slang has been verified and approved by your local 15-year-olds. Well, what do you think?? Did we miss any? Let us know in the comments below.